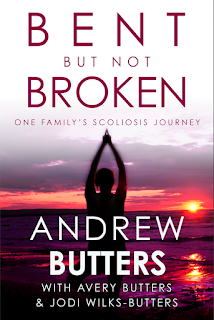 Our thoughts and experiences from the idiopathic scoliosis diagnosis in March 2014 through to surgery and recovery. 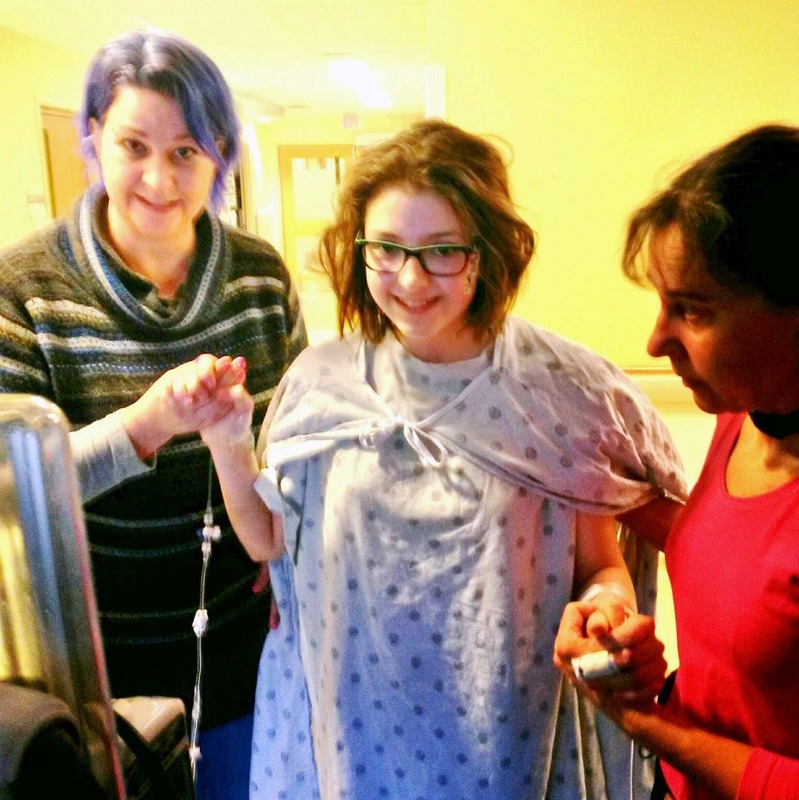 As told from the perspectives of both parents and (at the time) 12-year-old patient. Ontario, Canada. Book now available on Amazon or visit Oghma for more info. I was uncertain what the anniversary of Pants' surgery would bring. A year ago I was going through something that, even as a writer, I found almost completely indescribable. 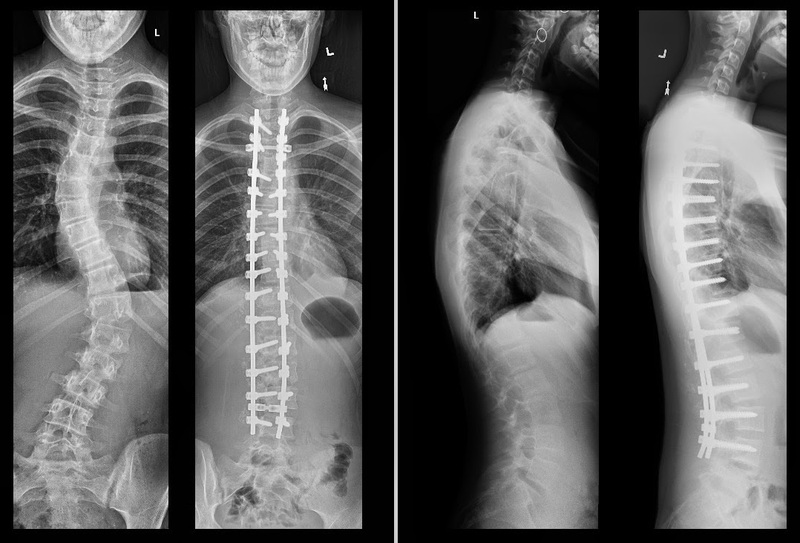 Part of me hoped that January 20, 2016, would feel triumphant - a giant middle finger to scoliosis and all the fear, trauma, and anxiety it caused my daughter as well as myself and the rest of our family. Instead, it was a slightly numbed and not-quite-disassociated repeat of the original emotions. It followed me around all day. Every minute I found to sit and reflect took me back to the same time of day a year ago. It shouldn't have been like that. At least, that's not what my expectation was, and it was all quite a bit more overwhelming than I think I was prepared to manage, especially considering that I was out of the country and couldn't even seek refuge in the warm embrace of Princess Pants, The Dude, or my wife. 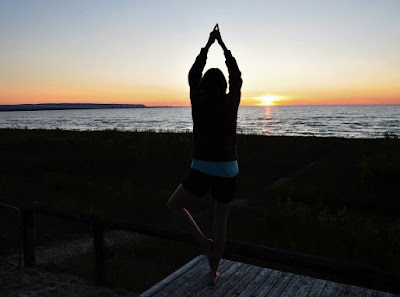 Yesterday morning I woke up and checked my email and did some Facebooking as I normally do and I took a gander at the blog. It turns out that on January 23 of last year Pants took her first steps since the surgery! I felt that the one-year anniversary of that momentous event deserved another just-as-momentous event (in fact, Jodi came downstairs shortly after me and had the same idea). During our last visit with Dr. Missiuna, he cleared her for all activities - except one. No trampoline! He also said her X-rays looked spectacular and that he wouldn't be seeing her for another twelve months. I thought one of us would have done a post back in December, but it seems we were too caught up in the holidays (and thinking about Gonzalo) to boast about this wonderful news. To say I was nervous about it was a bit of an understatement. So, back to yesterday. 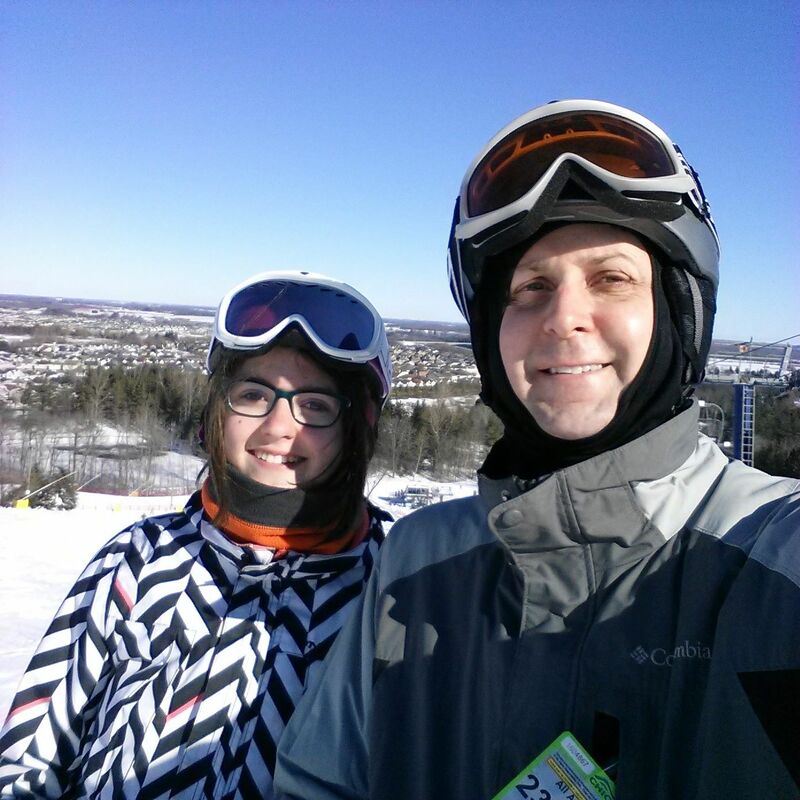 Jodi and I decided that since the weather was nice and there was snow on the hill that I'd take Pants out for a couple hours of skiing and see how she made out. If she was shaky and needed a refresher lesson I'd sign her (us) up for one for one of the couple weekends prior to the ski outing with her class (and me). She said to me afterwards, "I was nervous but after a few seconds my body was like, 'Hey, I remember how to do this!'" After every run (which only took about a minute as the hills are small) she was positively beaming. Most of the time I could only see her eyes through her goggles and for three hours yesterday the only thing I saw was pure joy. Last night as we were heading out to get burritos for dinner the most beautiful full moon was rising. After we ate dinner I ran out with my telescope and my Nikon and captured a few pics and declared that the first full moon of the New Year shall hereinafter be referred to as Avery's Moon. I was working in a video store sometime in the mid-1990's and we had The Beatles Yellow Submarine on the television for the customers to stare at while they were browsing for a movie to rent. The song "When I'm Sixty-Four" came on and the movie counted out a full minute. That was probably the first moment I was consciously aware of the fact that one minute is actually a very long time. When I'm Sixty-Four - For Angela from Wesley Furr on Vimeo. Watch the video above before you keep reading. Don't sing along or count out loud or in your head. Just watch. Sit and do nothing but stare. Continue reading when you're done. Welcome back. Did a minute feel like a long time or a short time? For me back in 1990-something, it felt like a long time. Regardless of how long it felt to you, I want you to multiply that by six hundred and sixty. Now imagine sitting around for that many consecutive loops of that video. Now, imagine that during this marathon of minutes your daughter was being cut open from neck to tailbone and having chrome cobalt rods affixed directly to her spine with twenty-seven titanium screws, each one secured in place to part of a vertebra that needed to have a hole drilled in it. Finally, imagine that the margin for error on the location of each hole was only 2 millimeters (funnily enough, that's about 1/64 of an inch on either side of the hole) and that any move outside that margin of error could result in your daughter being paralyzed. Now, does that feel like a long time? Before and after. Notice that the screws aren't exactly small. Pants was in surgery for roughly 660 minutes. Six hundred and sixty minutes that felt like an eternity. Since then, so many more minutes have gone by, and to me, it feels like they passed in just a fraction of the time. At the time of me typing this sentence, it has been 509,192 minutes since Avery got out of surgery and 509,072 minutes since we were allowed to see her. She was lying in a bed hooked up to three IVs and a breathing tube down her throat. Her face was swollen and she had sores and cuts in several places. She had hives all over her body from a reaction to something in surgery (possibly some of the 5 liters of blood they needed to transfuse). She looked like she had been hit by a truck, and that is the exact analogy the surgeon used when he was talking to us. She would have to stay intubated and sedated for another twelve hours. Imagine your daughter had been hit by a truck and she would not wake up for another 720 minutes. Seven hundred and twenty consecutive loops of the video, which happens to be sixty more loops than the eternity of hell you just went through. That was 508,357 minutes ago, and quite possibly one of the scariest, heart-wrenching, but also the most reassuring minute of my entire life. My little princess would be okay. The minutes that followed, just about every one of the more than half a million that have passed, have been all good. For me, that's the most amazing part of this whole journey. Pants never complained. Her attitude remained positive the entire way and her recovery followed the same path. About 445,768 minutes ago I wrote that the hard part was going to be slowing her down. With all the talk of kids today being coddled and "soft", all you need to do is find one facing a bit of adversity to see just how wrong that assertion is. Approximately 15,690 minutes from now I'm going to be away on business. I will be alone and thinking of my little girl. At that moment, it will have been exactly one year, 525,600 minutes since I walked her into surgery, and with tears in both our eyes kissed her on the forehead and watched her fall asleep. Of all the minutes between those two dates on the calendar marking one complete journey around the sun, there were more filled with stress, anxiety, fear, and emotional torture than any family should have to endure. But the good news is that those minutes were but a fraction of the total minutes that have passed since. The really good news is that at 8:01 AM on January 20, 2016, every single one of those minutes will be in the past. At that time, Princess Pants will be starting a different journey around the sun and our family will have an unknown number of minutes remaining to work with. With any amount of luck, it will be millions upon millions, which would please me greatly, because the last 508,407 seem to have passed a little too quickly. Hug the ones you love and make every minute count. Available as of January 20, 2018! Find it on Amazon or visit Oghma Creative Media for more info. Available as of January 20, 2018! Find it on Amazon or visit Oghma for more info.